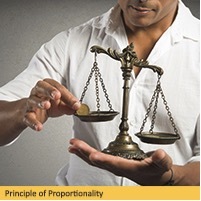 The proportionality principle stems from cost-benefit-analysis and is about optimisation. ‘Optimisation’ is the process whereby an organisation selects the management practices that make the best use of its limited resources. Applying the principle involves the balancing of anticipated benefits against the expected costs of doing something. In the context of this discussion, the ‘something’ in question is the adoption of a systematic and comprehensive calculation of the social value being generated by an agency such as a local authority or a housing association. How to recognise social value now a well-established debate in the UK and is a topic of concern in all sectors of the economy. Commercial, public, voluntary and charitable organisations of all kinds and sizes are seeking appropriate methods of measuring and declaring the social impact of their activities as a means of building or maintaining competitive advantage in terms of market positioning, customer loyalty, government support, and public opinion. The current operating climate for social landlords is increasingly challenging and it is now generally agreed to be important that organisations can demonstrate to funders, management boards and committees, regulators and stakeholders the full value of what is being delivered. Having said this, the social value debate throws up yet-to-be-resolved questions about the nature and scope of how to administer monitoring and measuring arrangements at the level of the individual organisation. In the context of the current debate, a real and present danger now exists. This danger stems from the existence of forces that could place unnecessary administrative burdens on organisations already struggling to respond to changes in economic conditions, customer expectations and legal obligations. In short, there is a danger that the requirement to identify and quantify social returns will result in new monitoring and reporting obligations that are unnecessarily complicated and disproportionately expensive. Four major forces are currently pushing organisations towards what might turn out to be inappropriate practices: (i) the interests of consultants; (ii) the desire to monetise outcomes; (iii) the assumed benefits of conformity; (iv) the desire to extend regulation. SROI (Social Returns on Investment) is an analytic tool developed by the New Economics Foundation to account for (and measure) a much broader area of value outcomes than is captured by traditional economic calculations. In particular, it seeks to take into account the social, economic and environmental consequences of economic activity. Its key feature is that it values outcomes by using financial proxies so that value-for-money decisions can be made using monetary measures. Its application can demonstrate to potential funders and internal decision-makers that, for example, a proposed investment will have a multiplier effect on economic growth or produce cost savings when social returns are taken into account. The Housing Associations’ Charitable Trust (HACT) is currently experimenting with a similar approach. This approach is more closely focused on measuring the social impact of community investment and seeks to measure social returns in terms of enhancements in ‘wellbeing’. Other UK housing consultancy groups, including HouseMark, are now actively advocating that the ‘social dividend’ generated by social landlords should not be hidden but identified, quantified, and declared. The long-standing issue surrounding the generation of social returns is that many community outcomes are real and important but intangible, difficult to measure and their receipt is spread over the life of the project or the building. By contrast, the investment needed to generate them is front-loaded, tangible and can be measured precisely. This contrast not only has the tendency to under-value the work of social landlords, but it can create a disincentive to invest. What both the SROI and HACT approaches have in common is an attempt to present social and wellbeing benefits in the form of cash calculations. The logic of this approach is broadly two-fold. Firstly, it reduces a wide variety of social outcomes to a common measure and this makes it easier to determine investment priorities. Secondly, it gives the appearance of concreteness and precision, thereby reassuring boards of management, potential investors, and politicians that the sector is contributing real social value to the communities in which they operate. Current accounting consistency across any particular economic sector or industry is managed by reference to a Statement of Recommended Practice (SORP). To ensure a degree of consistency across national barriers, the SORPs take some account of international practices – but their intention is to provide recommendations for how accounts should be kept, how financial reports should be presented and how to account for nationally-focused, sector-specific transactions. SORPs are issued and regularly updated by bodies recognised by the Financial Reporting Council (FRC) for that purpose. The FRC is the UK’s independent regulator responsible for promoting high quality corporate governance. Accounting for registered social landlords is a specialist activity and SORPs for the sector are issued by the National Housing Federation (NHF), Community Housing Cymru, the Scottish Federation of Housing Associations (SFHA), and the Northern Ireland Federation of Housing Associations (NIFHA). The Dublin body is the Irish Council of Social Housing (ICSH). Across the European Union, momentum is building for increased legislative and regulatory requirements with regards to the identification and measurement of social value. There does not yet exist an agreed approach to the measurement of social returns that is equivalent to those used by the International Accounting Standards Board. The question arises about whether an equivalent ‘hard’ standard is necessary or advisable. Currently, within the four national regions of the UK, there is a diversity of approach to the legal and regulatory requirements in this field. All four approaches, however, operate within an emerging European framework. This framework currently centres on the EU’s Single Market Act II 43 that places an emphasis on the ‘social economy’ of the Union. In his report for HouseMark, Professor Richard Tomlins comments that, “There is a clear message from the European Commission that voluntary approaches to accounting for social value have not had significant success and housing providers should expect further legislation if its appetite for the generation of social value is not satisfied” (p.14). To date, in three of the four national regions, government focus has been on commissioning and procurement practices – illustrated by the provisions of The Public Services (Social Value) Act 2012 for England and Wales and its subsequent review by the Young Report, the publication of the Welsh Procurement Policy documents, and the Procurement Reform (Scotland) Act 2014. These measures, together with their various ‘toolkits’, concentrate on the social value that can be achieved by developing local economic networks. It is, however clear that more general legislation and regulatory compliance rules are under consideration. Already, as part of the drive to encourage the creation of social returns, regulators are placing greater emphasis on the notion of “best value” in their VFM assessments. Best value organisations are those that commit to achieve the optimum returns (including social returns) from their investments rather than simply those prescribed by rules and regulations. There is no issue about the need to declare a social dividend. The case for every major social landlord doing so is overwhelming. The problem centres on the questions of proportionality and conformity. These are early days in the debate about how to instigate appropriate measuring and reporting systems. A significant amount of work has already been produced by credible consultancy organisations and a number of housing associations are in the process of piloting methods of calculating the social returns generated by their particular investments of time talent and money. The issue is not about ‘whether or not’ a housing agency should measure the social value it creates, but ‘how to do it’. There are three possible ways in which to measure social outputs and each has its own pros and cons. Provides a common unit of account that facilitates clear and unambiguous comparisons between investment choices. This method also allows easy comparison of social output performances between agencies. The time and effort involved in creating and operating a monetised system can be disproportionately expensive. The presentation of value judgements dressed as precise monetary measures can provide decision committees with pre-assessed decisions that inhibit further strategic thinking and planning. In some instances, cash measures can be misleading or even downright inappropriate. This method avoids the necessity of operating expensive quasi-accounting systems. It can also present information in a way that is less intimidating and easier to understand. By costing investment decisions by referencing the lost opportunities of alternative investments encourages a discursive approach to policy making. Although it may still require some form of financial calculation, this remains in the background and does not present policy committees with what appears to be a scientifically determined fait accompli – this makes it easier for decision groups and other stakeholders to question executive proposals and contribute to the policy debate. The pros of the monetised method outlined above are lost. This method measures what can be quantified easily (in cash and/or opportunity cost terms). It then identifies other intangible costs and benefits that cannot sensibly be given a clear cash or opportunity value, but are nevertheless judged to be relevant. These ‘residuals’ are included in the declaration of social value as ‘positives’ or ‘negatives’. They can sometimes be quantified by referencing appropriate soft units of account such as ‘tenant satisfaction’, ‘numbers of people helped or harmed’, ‘reputational risk’, ‘staff morale’, etc. This method avoids the necessity of operating expensive quasi-accounting systems. It can also present information in a way that is easily understood. Costing investment decisions by referencing the lost opportunities of alternative investments encourages a discursive approach to policy making. Unlike notions such as financial ‘profit’ or ‘surplus’, social value remains, to some considerable extent, a “contested concept”. Given the disputed nature of ‘social value’ and the fact that it is valued differently at different times and in different places, we must resist any political or commercial forces that might create pressure to introduce a universal, permanent ‘one size fits all’ approach to its monitoring and measurement. In particular, we should resist the instincts of regulators to push for the establishment of standardised practices that can then be used to stifle innovation and the independent judgement of individual organisations. Arguably, the most important issue is that of proportionality. The successful entrepreneur, Jean Paul DeJoria puts his success down to his focusing attention on the few aspects of business that are “vital” and not being distracted by the mass of relatively trivial information that is always retrievable if you have a mind to hunt it out. In some circumstances such as medical care and engineering, details are vital – but determining social value is not the same sort of activity as carrying out a surgical operation or building a bridge. The commitment to create and then identify a social dividend is more cultural than technical. As the creating of social value becomes seen as an aspect of the agency’s core business (i.e. not just a ‘bolt-on’ to the traditional landlord function), it will, of course, have to be identified, quantified and declared. This does not mean that the process needs to be complicated, nor does it mean that every element of the dividend should be given a monetary value. Practitioners should avoid being imprisoned by the desire to fill every corner of the assessment with mathematical detail or be concerned to standardise a methodology that uses an inappropriate unit of account. The SROI Network believes that the lack of a standard approach to measurement is in itself not important and that the key to being able to compare different values is “consistency in the principles”. In many instances, these, rather than unnecessarily precise indicators or values, will provide more meaningful measures. Furthermore, this approach can be flexed for different levels of rigour depending on the organisation’s purposes and stage of development. It is better to measure the right thing at the right time in a rough and ready sort of way than to ignore it or measure it with the sort of impressive refinement that is unnecessary, inflexible or misleading. Social accounts are recording information that is different from that found in financial accounts and statements. The notion that every social cost and benefit should be included in the assessment and be afforded a cash value feels wrong and is wrong. The single-minded pursuit of quasi-financial accounts in this field could lead to the introduction of monitoring practices that are not only expensive and burdensome to administer, but are also open to misleading interpretations. More work needs to done on how ‘soft measures’ can be blended into social value calculations in ways that produce less formulaic and more appropriate management tools that are less concerned with regulatory comparability and more concerned with stimulating a diverse range of creative thinking – as well as reporting mechanisms that make real sense to stakeholders. Ways of developing such a blended approach already exists in the methodology of cost-benefit-analysis. To be clear, incorporating soft measures into the monitoring arrangements (when judged to be appropriate) would utilize and adapt (not abandon) the excellent work already produced by HACT and the New Economics Foundation. What is needed is for the sector itself to generate ideas and flexible frameworks that landlords can consult and draw upon when devising their own bespoke systems for capturing the nature of their particular contributions to society. SROI Network 2015: “The SROI Network response to Social Value Act Review”.